Awhile back, I read and loved the book How We Choose To Be Happy, by Rick Foster and Greg Hicks (http://www.sonderbooks.com/Nonfiction/choosetobehappy.html ), so I was already familiar with the science of positive psychology. What Happy Women Know did not present new ideas to me, but it did provide a fresh look at some extremely good ideas. Reading this book was a huge encouragement. I’m in the middle of divorce negotiations, for a divorce I didn’t choose and don’t want. But I firmly believe that I can still live a happy life, if that is what I choose. I even found a t-shirt to buy that says “Happy Woman” surrounded by the pink circles from the book’s logo! ( http://www.acaciacatalog.com/ ) I DO choose to be a happy woman! “How happy are you right now? Do you even know? “Most women know what makes their partners, children, or friends happy, but when it comes to recognizing what lights up their own lives, they often come up short. If you’re looking for happiness, you have to start with the relationship you have with yourself. Is it healthy, loving, and nurturing? Or do you defer to your nay-saying inner critic, as so many women are prone to do? . . .
“Why not dream about a joyous life? Why not overcome the self-constructed barrier between what your life is and what you want it to be?. . .
“What Happy Women Know is intended to help you understand the importance of positive emotions and to make it easier for you to find your own happy place. It is also meant to point out how easy it is to fall into the many traps that hinder women in their quest for happiness. “A “happiness trap” is something that appears to offer the key to happiness but does just the opposite: It promises happiness but doesn’t deliver. In fact, it often becomes more of a trap because when happiness doesn’t ensue, people respond by redoubling their efforts. . . . The book looks at six happiness traps: perfectionism, wanton wanting, people-pleasing, revenge, “I’m nothing without him,” and inability to separate life and career. They close off the book talking about loss, health and happiness. This book was lovely, uplifting, and encouraging. The perfect book to read when you’re going through a difficult time, to help you see beyond the trouble to bright new horizons. Okay, it sounds trite when I put it like that, but this book gave me hope of going on to a joyful, vibrant life and in fact living that joyful life right now. It reminded me of things that, as a happy woman, I already know myself and do not have any intention of forgetting. I love the t-shirt because I’m proud to be a happy woman! I like that. Broaden your blissful horizons and read this book! This is not a book, it’s a product — but a good one. 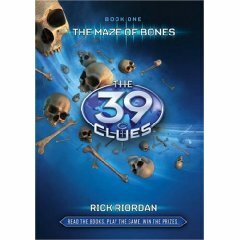 Scholastic has gotten some outstanding children’s authors to write ten books in The 39 Clues series. The captions on the back of the book say, “Read the Books, Collect the Cards, Play the Game, Win the Prizes.” All the books come with collectible cards in the front (though they’ve been removed from the library copies). I haven’t tried the game and haven’t seen the cards, so I will only comment on this story as a book. The book is a good one. Another fun adventure yarn for kids. I probably shouldn’t have read it so soon after The Mysterious Benedict Society, Larklight, or Lionboy, but this book is right in that same vein. A good clean adventure for kids. The Maze of Bones has some of the flavor of The Da Vinci Code, without the religious aspects, because we have a powerful family with clues planted hundreds of years ago in actual places all over the world. Amy and Dan Cahill thought they were their grandmother’s favorites. But they aren’t so sure, when, at the reading of her will, a contest is announced. Amy and Dan don’t seem to have any advantages. They have a choice: They can take a million dollars or the first clue. The clue is regarding “a quest of vital importance to the Cahill family and the world at large.” The winner may become the most powerful person in the world. The Cahill family is enormous, and several teams form, choosing to take the clue. How can Amy and Dan, two orphans without resources, possibly follow the clues and take on such powerful opponents? Is there anyone they can trust to help them? This book is well-written, and the adventure, full of narrow escapes and a trip to Paris, is compelling. If Scholastic did half as good a job with their contest, this is an impressive feat indeed. It’s interesting, though. My reaction is not, “I loved this book,” but rather, “I think kids will like this book a lot.” As I said, maybe I’ve been reading too many kids’ adventure novels lately, but although I enjoyed it, it didn’t really reach out and grab me. And I wish that Amy and Dan’s relatives weren’t all so mean. It will be interesting to see how well a varied group of authors can do in keeping the thread and feel of the series. Gordon Korman has written Book Two, and I am confident he is up to the challenge. I will definitely be watching how this series unfolds. I had not one but two parents tell me that their kids loved this book. When I saw it on audiobook, I thought I’d give it a try. 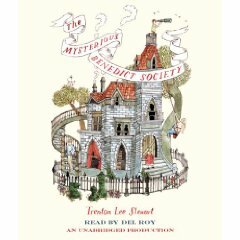 Audiobooks are working well for me for light-hearted fiction that I can enjoy in small doses. The adventure yarn that follows is a lot of fun. Sure, there are several coincidences and several places where believability is strained. However, it’s definitely an entertaining and exciting story. Del Roy’s voice sounds like a kindly grandfather telling you a story, and I quickly thought of his voice as coming from Mr. Benedict himself. Greenwillow Books, 2008. 224 pages. Sid Fleischman here pulls off an entertaining, interesting biography, in the spirit of Mark Twain himself. “Mark Twain was born fully grown, with a cheap cigar clamped between his teeth. It turns out that Mark Twain told different versions of his life story at different times. I like the way Sid Fleischman sorts through these to the likely truth, but makes it clear that this may be embellished. The book is peppered with photographs and illustrations from the time period, making it even more interesting. Mark Twain lived an exciting and colorful life, and this biography is anything but dull reading. Zondervan Publishing House, 1992. 304 pages. The authors definitely take a Christian perspective. Often, Christians think that we are supposed to be “nice” to everyone, and it doesn’t feel nice to hold onto our boundaries. The authors are good at showing why this doesn’t truly help anyone. 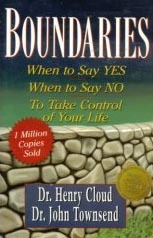 “Two aspects of limits stand out when it comes to creating better boundaries. The first is setting limits on others. This is the component that we most often hear about when we talk about boundaries. In reality, setting limits on others is a misnomer. We can’t do that. What we can do is set limits on our own exposure to people who are behaving poorly; we can’t change them or make them behave right. “Scripture is full of admonitions to separate ourselves from people who act in destructive ways (Matt. 18:15-17; I Cor. 5:9-13). We are not being unloving. Separating ourselves protects love, because we are taking a stand against things that destroy love. “The other aspect of limits that is helpful when talking about boundaries is setting our own internal limits. We need to have spaces inside ourselves where we can have a feeling, an impulse, or a desire, without acting it out. We need self-control without repression. It’s struck me that there are several boundary issues going on in my life right now. The big one is negotiating a divorce settlement. I started feeling guilty that we might have to go to court. But then I realized that if I don’t stand up for what I need and deserve, who will? Sometimes if being “nice” means allowing yourself to be mistreated, it’s not really very nice at all. “No weapon in the arsenal of the controlling person is as strong as the guilt message. People with poor boundaries almost always internalize guilt messages leveled at them; they obey guilt-inducing statements that try to make them feel bad…. I wasn’t particularly impressed with the writing in this book; I still find Melody Beattie’s books more inspiring. However, the concepts are basic and important and life-changing. This book deserves its status as a classic. I’ve been meaning to getting around to reading Obama’s second book ever since I read Dreams from my Father. Finally, I decided to listen to it, even though our library only has the abridged version in audiobook form. Read by the author, it occurred to me that he is the first presidential candidate in a long time whose voice I can actually enjoy listening to for several hours! 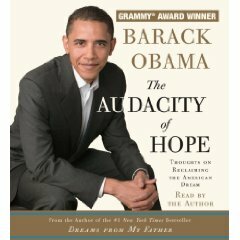 This book is still autobiographical, about Obama’s life when entering politics. Along the way, he talks about all kinds of issues that face politicians in America today. I like the way he talks about the values that Americans share. Here’s someone who can actually see the good in people who disagree with him. But don’t take my word for it. I highly recommend this book. If you want to know who is the real Barack Obama, I think you can learn much about him from hearing his thoughts on beginning a life in politics. Here is someone who truly seems to have entered politics in order to serve. You are currently browsing the Sonderbooks blog archives for October, 2008.